The renaissance of Jaguar has been one of the most surprising stories of recent years. In 2008 Tata bought the brand from Ford, who never quite got to grips with what to do with Jag, and made two very important decisions; Jaguar needed investment, and Tata put plenty of cash on the table, but crucially it didn’t need management interference. The XE is the latest confirmation that Tata was absolutely right. 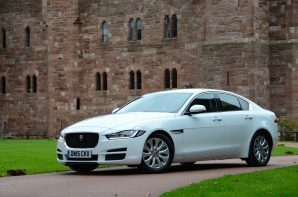 Jaguar never forgot how to build contemporary executive saloons, it just wasn’t allowed to. The XE takes the fight to the BMW 3 Series, Audi A4, and Mercedes C-Class head on and is all the better for it. Jaguar is very proud of its extensive use of aluminium but we have to say the evidence isn’t clear cut on the scales. Yes the XE is at the lighter end of the spectrum but there is little between it and the competition. More convincing is the new Ingenium engine which cost £500 million to develop. It’s powerful, torquey, lightweight, compact, efficient, and crucial enables the XE to become the first Jaguar to meet the RDE2 diesel emissions standard which means it attracts a lower BIK and VED rating. All of the main contenders in this sector have conservative styling, and Jaguar has followed the same path. Inside and out the XE looks neat and tidy and the adoption of additional display screens in the dashboard adds a little pizazz. The back has more than a whiff of Audi and the interior doesn’t quite feel as rock solid as it might, but it’s a handsome and very well proportioned car. Of course of utmost importance to us is how it drives, and here the XE is in its element. With near 50:50 weight distribution, rear-wheel drive and one of the better electric power steering set-ups it leaves the A4 and C-Class in the shade and mixes it with the 3 Series. If you like your saloons with a dose of involvement and feel-good factor, the XE has to be on your shortlist. Which car is most efficient for you? GreenCarGuide.co.uk, launched in 2006, is the UK's original green car news site. GreenCarGuide.co.uk provides information to motorists about the latest green cars in a quality, informed and engaging way. The site focuses on green cars that are best in class in terms of low emissions and high fuel economy and efficiency, but that are also great to drive. Our Green Car Guide is updated monthly and contains the lowest emission cars in ten different categories – split into diesel cars, petrol cars, and other technologies such as hybrids and electric cars. Which Is The Most Economical & Best Family Car in the UK?